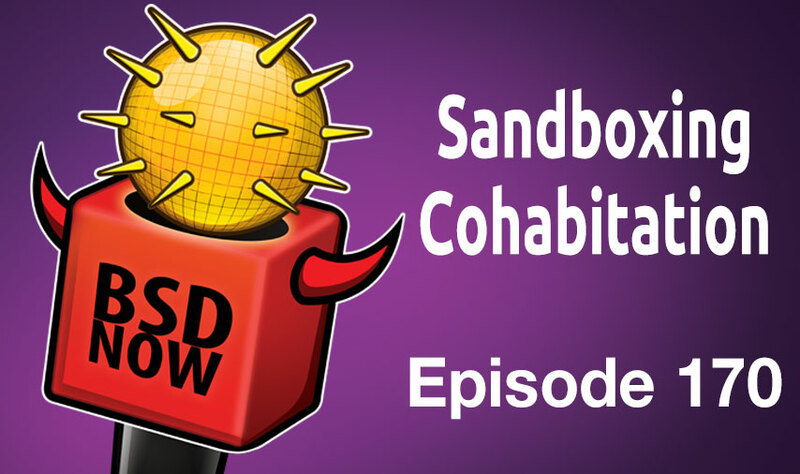 This week on the show, we’ve got some new info on the talks from EuroBSDCon, a look at sharing a single ZFS pool between Linux and BSD, Sandboxing & much more! Stay tuned for your place to B…SD! Due to circumstances beyond the control of the organizers of EuroBSDCon, there were not recordings of the talks given at the event. Eric McCorkle, who has contributed ZFS support to the FreeBSD EFI boot-loader code has posted an in-depth look at how he’s setup dual-boot with FreeBSD and Gentoo on the same ZFS volume. The rest of the article walks us through the individual commands that make up each of those steps, as well as how to craft a GRUB config file capable of booting both systems. Personally, since we are using EFI, I would have installed rEFInd, and chain-loaded each systems EFI boot code from there, allowing the use of the BSD loader, but to each their own! SafeStack is part of the Code Pointer Integrity (CPI) project within clang. 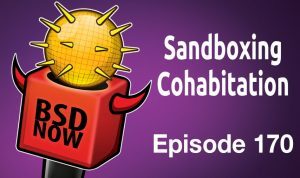 We’ve talked about OpenBSD’s sandboxing mechanism pledge() in the past, but today we have a great article by Kristaps Dzonsons, about how he grew to love it for Web Sandboxing. I use application-level sandboxing a lot because I make mistakes a lot; and when writing web applications, the price of making mistakes is very dear. In the early 2000s, that meant using systrace(4) on OpenBSD and NetBSD. Then it was seccomp(2) (followed by libseccomp(3)) on Linux. Then there was capsicum(4) on FreeBSD and sandbox_init(3) on Mac OS X. All of these systems are invoked differently; and for the most part, whenever it came time to interface with one of them, I longed for sweet release from the nightmare. Please, try reading seccomp(2). To the end. Aligning web application logic and security policy would require an arduous (and usually trial-and-error or worse, copy-and-paste) process. If there was any process at all — if the burden of writing a policy didn’t cause me to abandon sandboxing at the start. And then there was pledge(2). Let’s play a drinking game. The challenge is to stay out of the hospital. 2. Read it to the end. 3. Drink every time you don’t understand. Now Kristaps has his theory on why these are so difficult (NS..), but perhaps there is a better way. He makes the case that pledge() sits right in that sweet-spot, being powerful enough to be useful, but easy enough to implement that developers might actually use it. All in all, a nice read, check it out! Would love to hear other developer success stories using pledge() as well. OS News has an interesting tidbit on their site today, about the entire commit history of Unix now being available online, starting all the way back in 1970 and bringing us forward to today. The history and evolution of the Unix operating system is made available as a revision management repository, covering the period from its inception in 1970 as a 2.5 thousand line kernel and 26 commands, to 2016 as a widely-used 27 million line system. The 1.1GB repository contains about half a million commits and more than two thousand merges. The repository employs Git system for its storage and is hosted on GitHub. It has been created by synthesizing with custom software 24 snapshots of systems developed at Bell Labs, the University of California at Berkeley, and the 386BSD team, two legacy repositories, and the modern repository of the open source FreeBSD system. In total, about one thousand individual contributors are identified, the early ones through primary research. The data set can be used for empirical research in software engineering, information systems, and software archaeology. This is a fascinating find, especially will be of value to students and historians who wish to look back in time to see how UNIX evolved, and in this repo ultimately turned into modern FreeBSD. Ever wondered about the details of socket multiplexing, aka the history of select(2)? Well Marek today gives a treat, with a quick look back at the history that made today’s modern multiplexing possible. In mid-1960’s time sharing was still a recent invention. Compared to a previous paradigm – batch-processing – time sharing was truly revolutionary. It greatly reduced the time wasted between writing a program and getting its result. Batch-processing meant hours and hours of waiting often to only see a program error. See this film to better understand the problems of 1960’s programmers: “The trials and tribulations of batch processing”. Enter the wild world of the 1970’s, and we’ve now reached the birth of UNIX which tried to solve the batch processing problem with time-sharing. This all changed in 1983 with the release of 4.2BSD. This revision introduced an early implementation of a TCP/IP stack and most importantly – the BSD Sockets API. Although today we take the BSD sockets API for granted, it wasn’t obvious it was the right API. STREAMS were a competing API design on System V Revision 3. Select was introduced to allow applications to multiplex their I/O. Consider a simple application like a remote login. It has descriptors for reading from and writing to the terminal and a descriptor for the (bidirectional) socket. It needs to read from the terminal keyboard and write those characters to the socket. It also needs to read from the socket and write to the terminal. Reading from a descriptor that has nothing queued causes the application to block until data arrives. The application does not know whether to read from the terminal or the socket and if it guesses wrong will incorrectly block. So select was added to let it find out which descriptor had data ready to read. If neither, select blocks until data arrives on one descriptor and then awakens telling which descriptor has data to read. […] Non-blocking was added at the same time as select. But using non-blocking when reading descriptors does not work well. Do you go into an infinite loop trying to read each of your input descriptors? If not, do you pause after each pass and if so for how long to remain responsive to input? Select is just far more efficient. Select also lets you create a single inetd daemon rather than having to have a separate daemon for every service. In this discussion I was afraid to phrase the core question. Were Unix processes intended to be CSP-style processes? Are file descriptors a CSP-derived “channels”? Is select equivalent to ALT statement? I think: no. Even if there are design similarities, they are accidental. The file-descriptor abstractions were developed well before the original CSP paper. It seems that an operating socket API’s evolved totally disconnected from the userspace CSP-alike programming paradigms. It’s a pity though. It would be interesting to see an operating system coherent with the programming paradigms of the user land programs. A long (but good) read, and worth your time if you are interested in the history how modern multiplexing came to be. fsnotifier for OpenBSD and FreeBSD — The fsnotifier is used by IntelliJ for detecting file changes. This version supports FreeBSD and OpenBSD via libinotify and is a replacement for the bundled Linux-only version coming with the IntelliJ IDEA Community Edition. A Puppet package provider for FreeBSD’s PkgNG package manager.